A registered dietitian with a master's in public health from Hunter College in New York City, Shira Isenberg has been writing for diet and health websites since 2001. She currently writes a regular nutrition column for a quarterly Jewish periodical, the Jewish Action. Many people think of salads as foods that will help them lose weight. It’s true that most salad vegetables are low in calories, which is important when trying to lose weight. According to the Mayo Clinic Diabetic Exchange Lists, one serving of nonstarchy vegetables (1/2 cup cooked or 1 cup raw) contains only 25 calories. However, vegetable salads often contain ingredients that bring the calorie count up. Eating too many high-calorie salads could hinder weight loss. When salads are high in calories, it is generally the dressing that is responsible. Dressings are usually oil-based, and oil contains 120 calories per tablespoon. Although most oils contain healthy fat, their high-calorie content necessitates portion control when trying to lose weight. Instead of pouring dressing over your salad, dip your fork in the dressing and spread it throughout the salad. You will use less dressing with this method. The American Dietetic Association recommends modifying your vinaigrette recipes to include more vinegar than oil, since vinegar is low in calories. According to the Mayo Clinic, corn and potatoes are both starchy vegetables. These vegetables contain more calories per serving than nonstarchy vegetables. If you use starchy vegetables in a salad, it will probably be higher in calories than a typical green salad. For example, an average homemade potato salad contains 358 calories per cup according to CalorieKing.com. Nuts are a delicious addition to salad, adding crunch and flavor, as well as heart-healthy fat. However, nuts can be high in calories, especially when eaten in large amounts. Portion control is essential if you are considering adding nuts to your salad. Measure out the amount you would like to use, rather than pour directly from the nut container, to control the calorie content of your salad. Avoid candied nuts which will bring the calorie content of your salad up even higher due to their sugar content. Croutons are a staple in some salads, like Caesar salad. But even if made from whole wheat, croutons add unnecessary calories to salads. One cup of plain croutons contains 122 calories, according to CalorieKing. Cutting down on croutons or skipping them altogether could reduce the calorie content of your salad. At restaurants and fast food places, salads may seem like a diet-friendly choice, but be wary -- they can be a calorie trap. 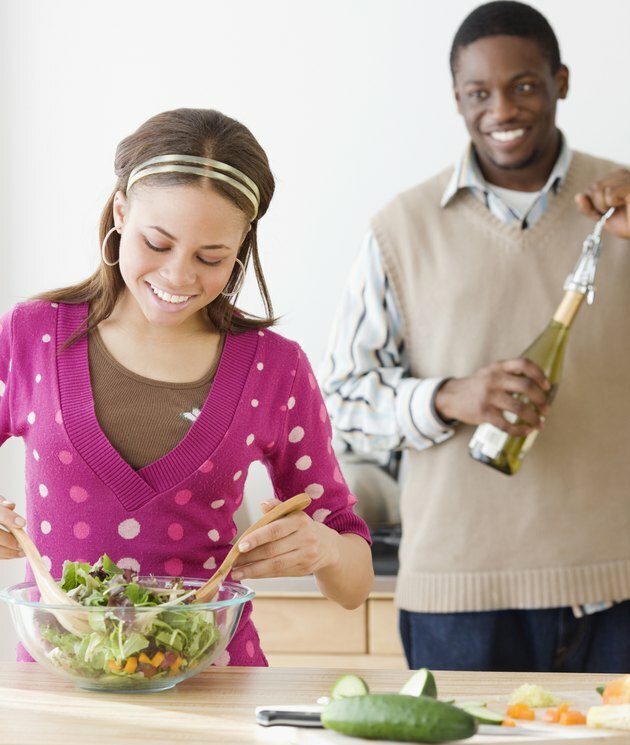 Find out if low-calorie dressings are available and make a habit of asking for it served on the side, to cut calories. Also limit yourself to just one type of high-calorie topping, like nuts, croutons, or cheese.